A consistent and humbling sense of the eternal pervades this memoir and makes it hard to resist the prevailing call to authenticity. Irene Weinberg’s debut contributes to the growing body of afterlife narratives, adding to it both a needed dose of inclusivity and a practical agenda for searching souls. 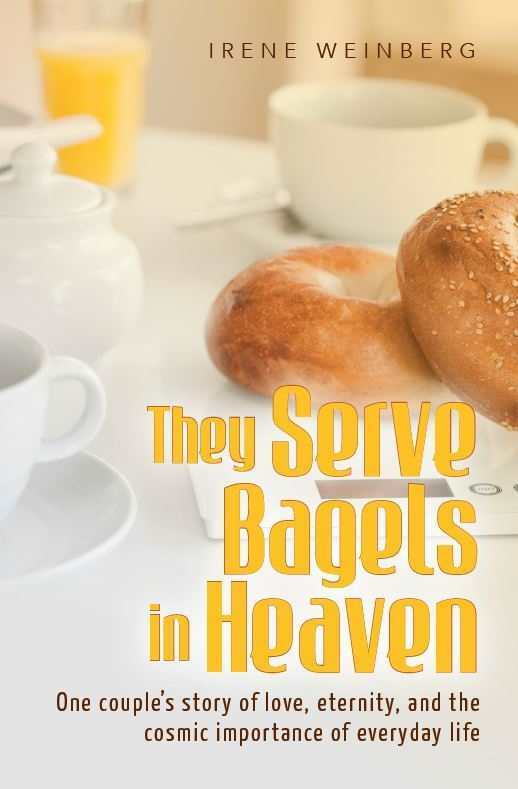 Brimming with humor, love, and narrative flair, They Serve Bagels in Heaven has the necessary ingredients to charm even the most skeptical readers. As Irene and her husband, Saul, were winding their way toward retirement, Irene began to receive premonitions that they wouldn’t arrive there together. “Saul has to go,” an inner voice warned her, and later, “He’s not going to make it. You are.” Returning from a weekend getaway, the couple’s car flipped, bringing these warnings to devastating fruition. But their relationship didn’t end with Saul’s death. A chapter immediately after the crash turns the narration over to Saul, who speaks through mediums to Irene from heaven. He describes heaven as a place of infinite love, the creative source of which “is so large and eternal that it takes a huge diversity of cultures and traditions to even come close to a full expression of [its] totality.” Saul walks streets that are the perfected versions of earthly cities, is aided by angels, and noshes on bagels with familiar souls. Presented images are both lovely and awe inspiring. But as Saul moves toward acceptance, he learns that his soul’s purpose, for his last lifetime, remains unfulfilled. The articulation of “soul purposes” is the memoir’s stated cause, and the Weinbergs’ rejoinders to live authentically create a compelling call to action. But equally enlightening are stories shared from the couple’s supposed past lives, which become beautiful expressions of the concepts of fate and intentional reincarnation: They meet first as student and teacher in Roman Palestine, then as Catholic lovers in sixteenth-century Italy. They return to each other in a shtetl, where one is lost to a pogrom. Their next lives find them continents apart, and one is lost to the Holocaust. Eventually, they manifest as Irene and Saul, charged, this time, with being exemplars of love and family. Weinberg writes these stories with grace and verve. Mentioned incarnations all brim with vitality. Even those readers compelled to reject theologies of rebirth will find these characters sympathetic and appealing. Without pushing particular religious traditions, Irene, with Saul at her back, charges readers with a task: let God in. “When God gets inside you,” the book states, “you instantly know who you are,” and your “soul map” becomes clear. Weinberg’s creative, interfaith presentation of life after life imparts both wonder and hope. These pages contain appealing spaces for readers of every stripe. Skeptics may choose to gravitate to the versions of Irene and Saul down through the ages. Those with questions surrounding eternal punishment and reward will find their answers too. A consistent and humbling sense of the eternal pervades, making it hard to resist the prevailing call to authenticity. They Serve Bagels in Heaven addresses all that has been and will be; it is remarkable, then, that Weinberg accomplishes her task so neatly and with such approachability. She has done a true mitzvah for her readers in this transcendental love story that encourages people to see how each life matters.